The history of Samba music is very interesting. It has been performed in carnivals and in street dances during the pre-Lenten celebration in Africa and Brazil for almost a century. Although the history of Samba can be traced back to Africa, the dance is especially very popular in Rio as its mixture of cultures and races allowed it to evolve into many different forms and styles. In the beginning of the 20th century, Brazilian samba became more and more famous for its distinctive and catchy style of music, popularized by the black immigrants from Bahia. In their attempt to incorporate the dance and the music into the local culture, they set up samba schools or escolar de samba in various areas in the community. The school was usually run by large dance groups and samba performers in hopes of the community's acceptance of the music. The very first samba recording in the country was "Pelo Telefone", released in 1917 by Donga and Mauro Almeida. Its huge success created a bridge and brought the music outside of the black community and on the local people. Up until today, no one can really tell the exact history of Samba. However, many historians believe that it was formed by a group of musicians from Tia Ciata. An interesting part of the history of Samba music is the part played by Ismael Silva. He established the very first escolar de samba or samba school, which he named Deixa Falar. Ismael purposely transformed the beat of the music to make it fit the carnival atmosphere in Rio, which was a very popular and common event in the country. And because of this, the music was extremely well received by people. Eventually, it spread on to many other cities throughout Brazil. The music also gained the support of the then nationalist leader, Getulio Vargas, who later declared it as the official music of the country. The history of Brazilian samba has developed into many types and forms - from the fast-paced drum orchestras played during carnivals and street parades to the more gentle and sensuous samba-cancao. 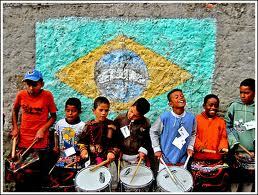 One of the newest styles of samba that emerged in Rio is the bossa nova music. This new style of music was created by the middle class white people, which over time gained an identity of its own. Two of the most famous bossa nova musicians in the country were Antonio Carlos Jobim and Joao Gilberto. During the 1960's, bossa nova especially became more and more popular among leftist musicians. After the political turmoil in the 60's, Samba finally made it back to the airwaves. Samba varieties that were once forced into the underground (such as disco and samba rock) resurfaced on the radios and back into the carnival scenes. The history of Samba is now deeply rooted in the Brazilian culture. Up until today, the music is still one of the most popular kinds there is in the country and is now one of the most loved dances all over the world. As you can see, the history of Samba music has gone through a lot of changes and is now known as the "Music of Brazil."